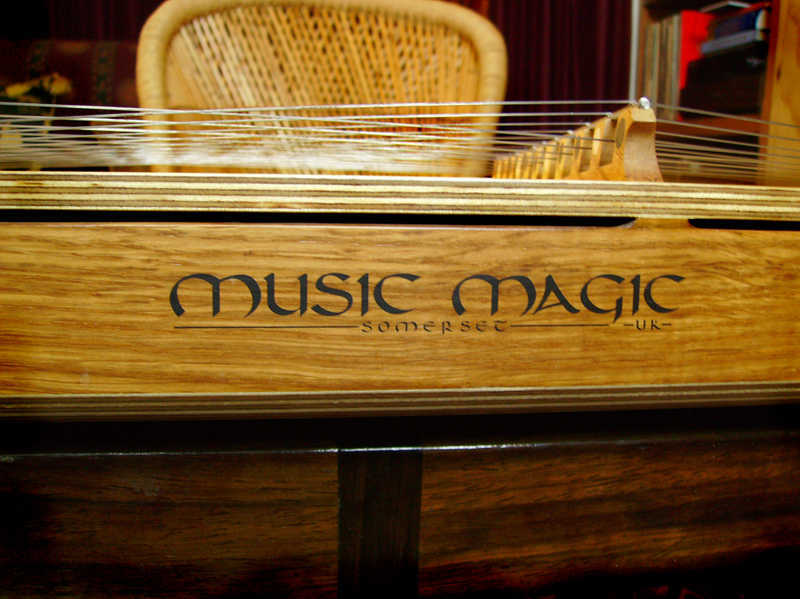 The story of Music Magic starts goes back to the early 70’s when Tim made his first musical instrument, a Bass guitar. Fast forward to the early 90’s and the recession of that period when Tim was working as Production Manager at Colour Studios an exhibition graphics company. During that time for the company there was little actual work around and Tim used the opportunity to hone up his wood working skills using the equipment there and started to make small instruments like Psalteries for children. It wasn’t long before people discovered his skills and started to request him to make instruments for them. Before long Tim discovered the unique sound of the Dulcimer and became a Professional Luthier in 1995. 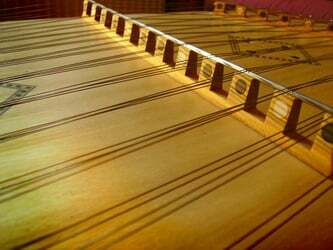 In the early period many different instruments were made such as Lyres, Tongue Drums and Appalachian Dulcimers. After this initial period of exploration with different musical instruments Tim started to concentrate on making Hammered Dulcimers. 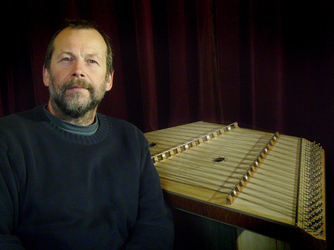 From the mid 90’s to the 2000 Tim toured the summer festivals in the UK with his Dulcimer stall and combined the individual manufacture of the instruments with Dulcimer performances and workshops at Events such as Womad, Glastonbury and Lamer Tree festivals among many others. Tim makes each Music Magic instrument on an individual basis in a small workshop in Frome, Somerset. There are no computer routers or jigs involved. Timber is a unique product the result of the wind the sun and earth and does not always respond well to being forced to conform exactly to the rigid constraints of mass production. Every part of the instrument has had the individual attention of the designer and maker. ‘Fossil fuels are running out’ This truism was first heard in the 70’s. Imagine the damage we could have saved to the planet, had we heeded the warning then and made electricity from wind water and sun. Tim is keen to produce quality instruments and also to have as low environmental impact as possible. available in our webshop at £350!!! Harmony and Maestro can both be played to the right of the bass bridge. These three cover the developing requirements of most players, while also providing a progressive route for development when a player wishes to develop further. These instrument represent all that is required to learn, develop and for giving virtuoso performances. None of these instruments are Budget instruments; they are all built to the same high craftsman quality. Air miles and fuel miles. The instruments are made in UK in Somerset near Bath using mostly local timber and from sustainable or managed resources. The timber is sourced mostly from Charletons Timber a family run sawmill 7 miles from Frome. Tim also uses a supplier who has good connections with ornamental gardens. Timber is for example sometimes used from Kew Gardens. If an interesting tree like a walnut gets blown down in a winter gale for instance some of the timber sometimes finds its way to Frome. The Timbers Tim uses most are air dried local Beech for wrest planks and pin blocks, Ash and Oak and Sycamore for rails in combination with Laminated Birch from Scandinavia or Russia for sound boards and bottoms. If a hand tool can do the job Tim uses the hand tool it saves waste saves energy and is often a good form of exercise. Very little tropical hardwood is used other than as an occasional decorative element and even then the minimum is used in order to obtain a balance between beauty and sustainability. The instruments have developed slowly over the period. No radical design changes are made in order to maintain quality and assist consistency of build. The instruments are not principally designed to be quickly factory made. The design aim of Music Magic instrument is to create a modern instrument with attractive classic lines and minimal of fussiness. 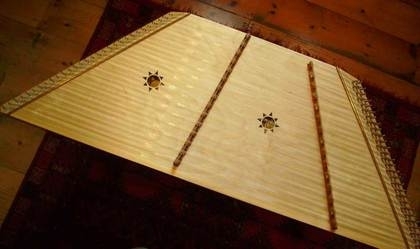 The most important element though is the soundboard, which has been designed for maximum sympathetic resonance. The instruments are supplied ‘ex-works’ directly from Tim. Each instrument is supplied with a T tuning wrench and two pairs of playing hammers a ‘hard’ set and a ‘soft’ set and a guide book with information regarding tuning and care of the instrument etc. 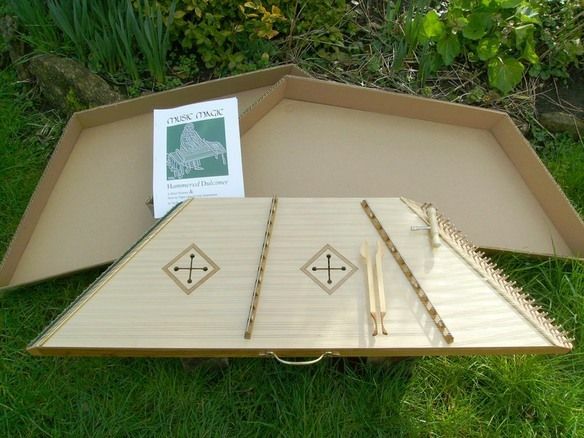 Each instrument also comes supplied in a bespoke dulcimer shaped tri-wall cardboard box. Instruments may be picked up by appointment or posted. If you chose the post option a plywood frame with hardboard top and bottom is constructed round the box in order that the instrument will arrive undamaged and in tip top condition. Over the years Tim has supplied instruments to complete novices, experienced professionals, composers of music for TV and film and theatre and even the great Peter Gabriel. Instruments have been supplied mainly to the UK and European market. The exchange rate between Britain and the UK has not been conducive to the development of that market.